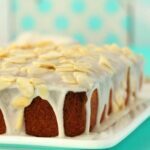 This vegan pound cake with an almond glaze turned out super well. I’m ridiculously pleased about it. Mostly because it took me AGES to figure it out! Traditionally a pound cake is made with a pound of flour, a pound of sugar, a pound of eggs and a pound of butter (the recipe usually makes more than one loaf if you were wondering why so much of each!). 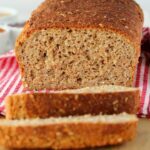 Now here’s the thing, when you want to veganize a recipe, and you need to replace 1 egg, it’s really quite simple, you can just use 1 flax egg or you can use some applesauce or something, it’s not a big deal. But when you’re replacing a whole lot of eggs (like 4 of them for one loaf of pound cake), it gets more challenging. The thing is you can’t ever use 4 flax eggs or a whole heap of applesauce because when eggs are cooked they firm up, they become solid, they provide structure. Flax eggs and applesauce don’t do that. So with this vegan pound cake, I had to do a lot of improvising and I tried all sorts of combinations, and in the end did not replace the eggs at all, not at all. I used vegan butter, sugar, flour and vegan buttermilk as the main ingredients. 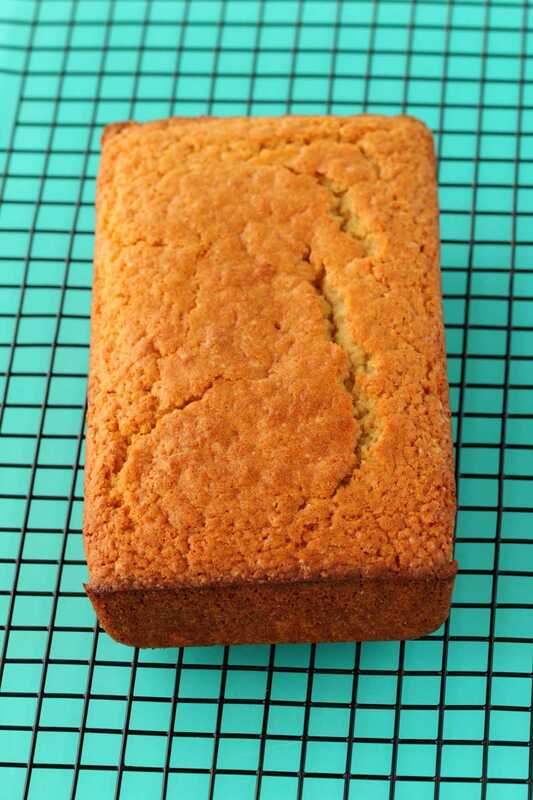 The result might be a tiny bit lighter and fluffier than a traditional pound cake, with a slightly looser crumb, but it’s still much denser than a sponge cake and works very well for this. Another little snafu I was running into was a case of sinking in the middle! And then thankfully I found a great troubleshooting article which goes through all the reasons this can happen, most of which I was aware of but one important one that I didn’t know. So since my baking powder was fresh, I was not opening the oven when my cake was rising, and I was not overbeating my batter, my oven temperature was correct, and I was not leaving my batter to sit for too long before baking, I realized that what I WAS doing wrong was using too much baking powder. The ratio is 1 to 1 and 1/2 tsp baking powder per cup of flour, not more than that when you’re making cakes. Since my recipe uses 2 cups of flour, the maximum amount of baking powder I can then use is 3 tsp. And when it was sinking in the middle I was using 4! It was sinking in the middle because the cake was rising too fast without enough structure to support it, hence the collapse in the middle. So as soon as I dropped the baking powder down to 3 tsp that problem was solved. The other little issue I had was too much browning on top. 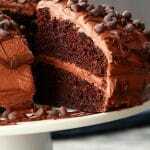 This cake bakes for an hour. So does my vegan banana bread, but with banana bread, if it gets browned and crispy and caramelized on top it’s just perfect, whereas with this, you don’t want it too brown on top. The solution? Tent it with foil for the last 20 minutes of baking. And if you’re wondering what ‘tenting’ is, it’s exactly like it sounds. Take foil and place it in a tent like shape over the top of your loaf pan. 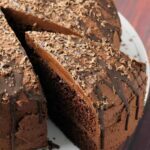 It allows it to continue to bake without over-browning on top, while also protecting your cake so that the foil doesn’t push down on it from the top (the reason for the ‘tent’, rather than just putting foil over the top). Since it’s only for the last 20 minutes, the cake has done all its rising by then so opening the oven at this point to put a foil tent over the top doesn’t interfere with your cake rising and doesn’t cause any sinking side effect. 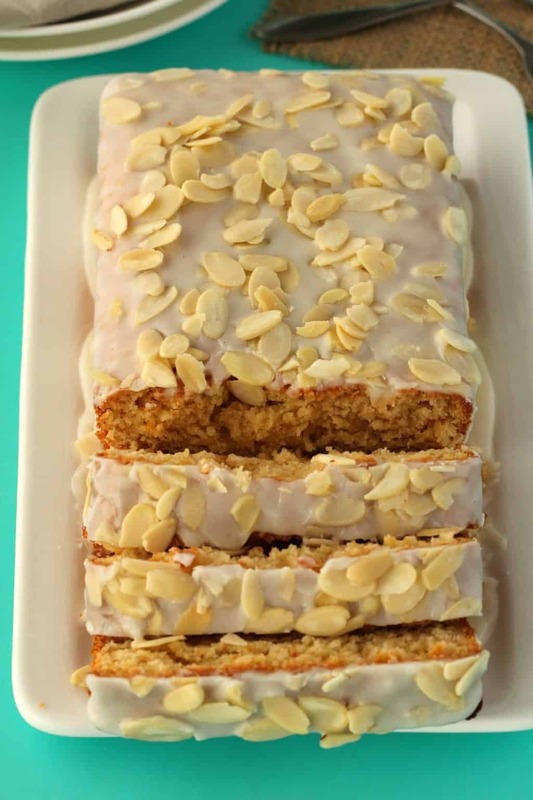 The almond glaze on top was because as delicious as this vegan pound cake is, well sometimes pound cake can be considered a little…. boring. It’s really quite plain, like you’d probably want to serve it with something else, like a fruit compote and vegan whipped cream or ice cream or something to jazz it up a bit. 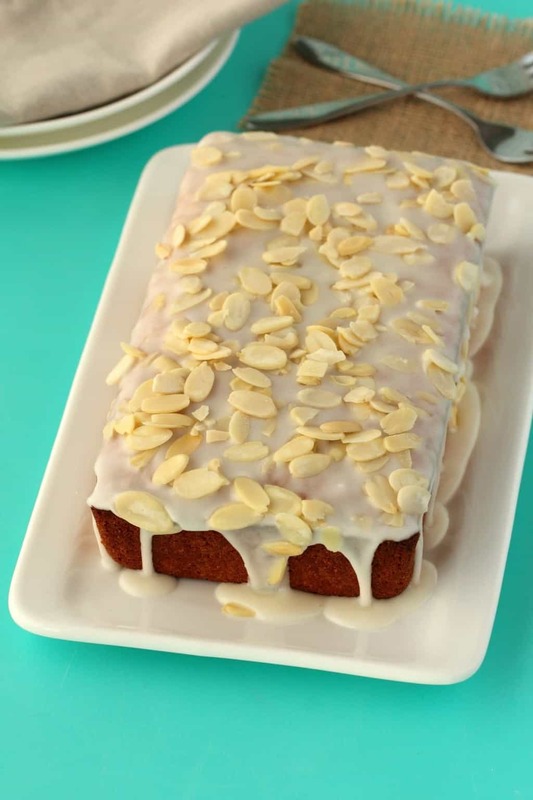 But with the almond glaze and lots of almond flakes on top, this jazzes it up very nicely and it looks and tastes absolutely delicious. Keep it covered at room temperature where it will stay good for a few days or covered in the fridge where it will stay good for up to a week. 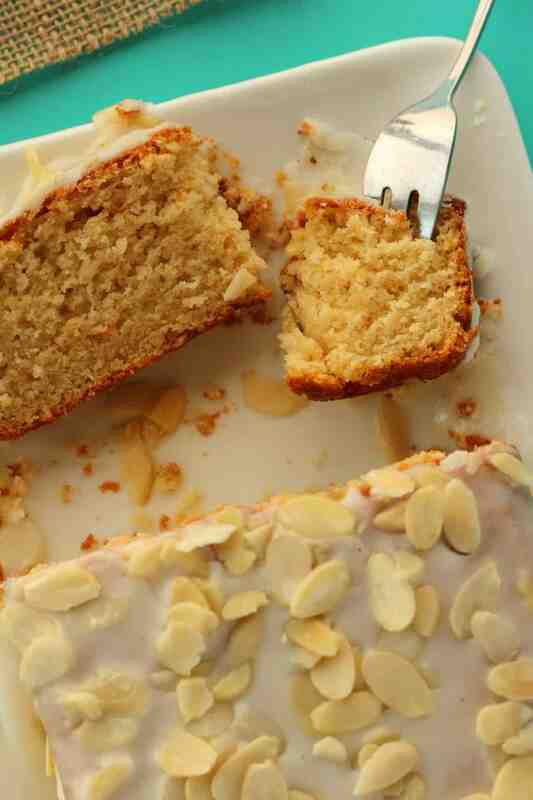 Let us know in the comments what you think of this vegan pound cake and please do rate the recipe too, thank you! Sign up to our email list for a fabulous (and free) dinner recipes ebook and to stay updated with all our latest recipes posted to the blog. 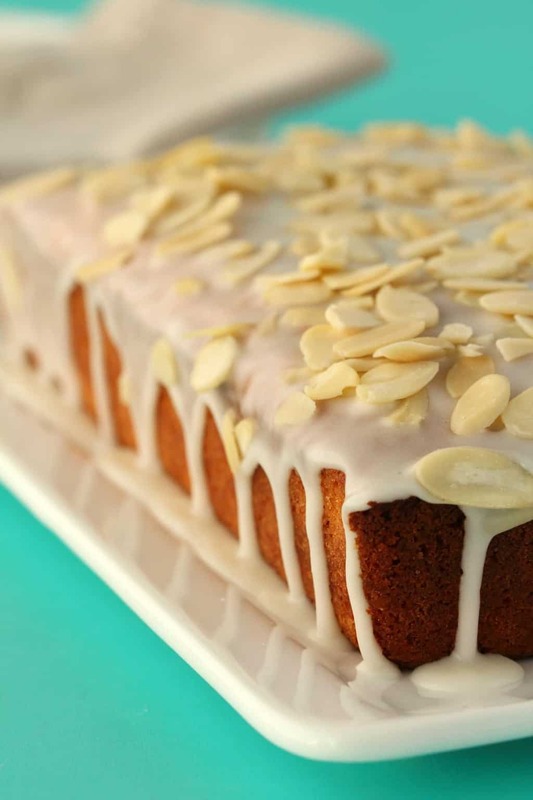 Vegan pound cake with an almond glaze. 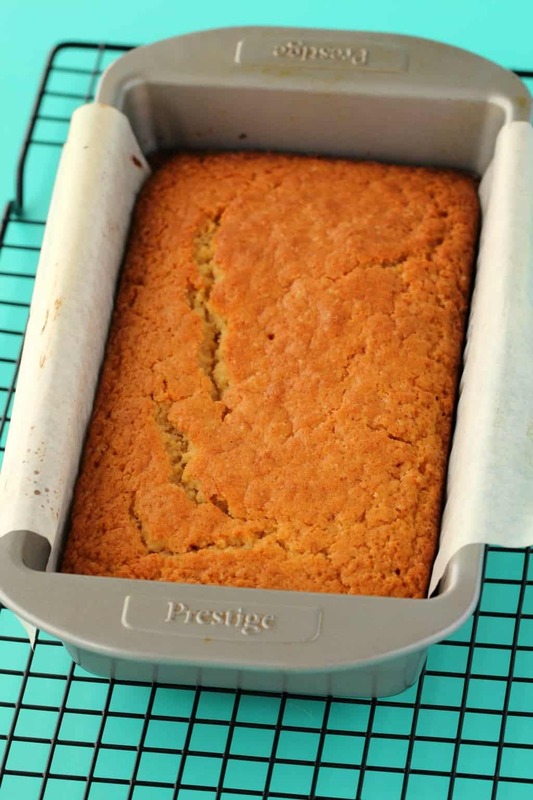 Moist, rich and dense (but not heavy) this pound cake is super simple and absolutely delicious. Add the vegan butter and sugar to the bowl of an electric mixer and cream them together. Add the vanilla extract and mix in. Sift the flour into a mixing bowl and add the baking powder and salt and mix together and then add into the bowl with the vegan butter and sugar. Make your vegan buttermilk by adding 1 Tbsp fresh squeezed lemon juice to a measuring jug and then pouring in soy milk up to the 1 cup (240ml) line and then stirring in so it curdles. You can also use almond milk if you prefer. Add to the other ingredients. Mix into a batter with a spoon. The batter will be thick. Mix in properly but be careful not to overmix. Spray a loaf pan with non-stick spray and then line it with parchment paper. The best way to do this is to let the parchment paper hang over the sides so that when your cake is done you can just lift it out. 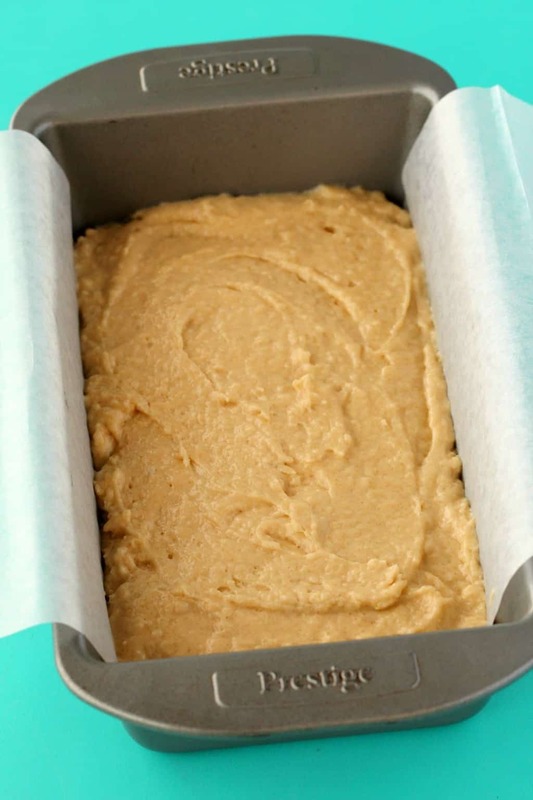 Transfer your cake batter to the loaf pan and smooth it down. Place into the oven to bake for 60 minutes. At the 40 minute mark, bring out the cake and add foil to the top in a tent shape. So let the top be quite high (in a tent shape) so that it doesn’t press down on the cake from the top. Put the cake back in for the last 20 minutes. 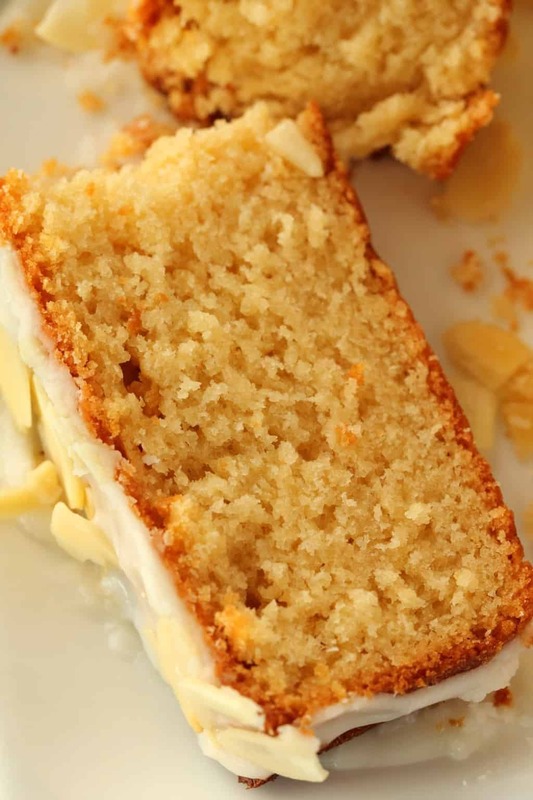 It’s ready when a toothpick inserted into the center of the cake comes out clean. 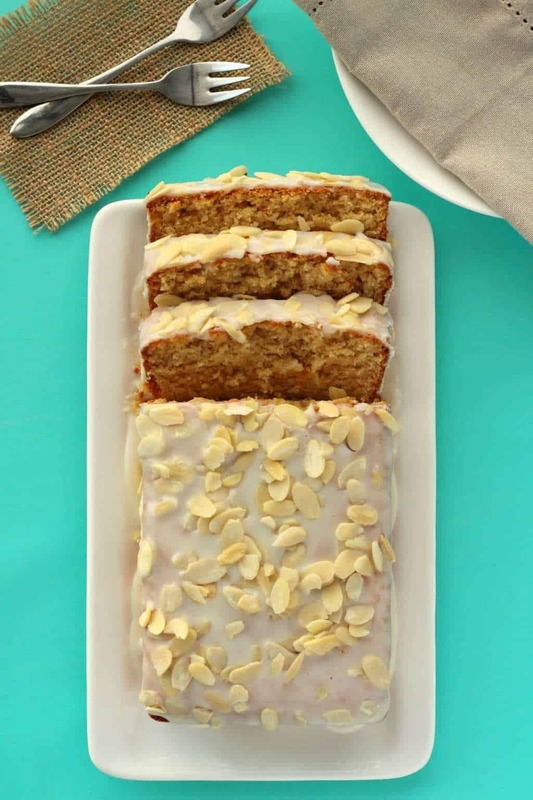 Lift the cake out with the parchment paper and place onto a wire cooling rack to cool completely before frosting. 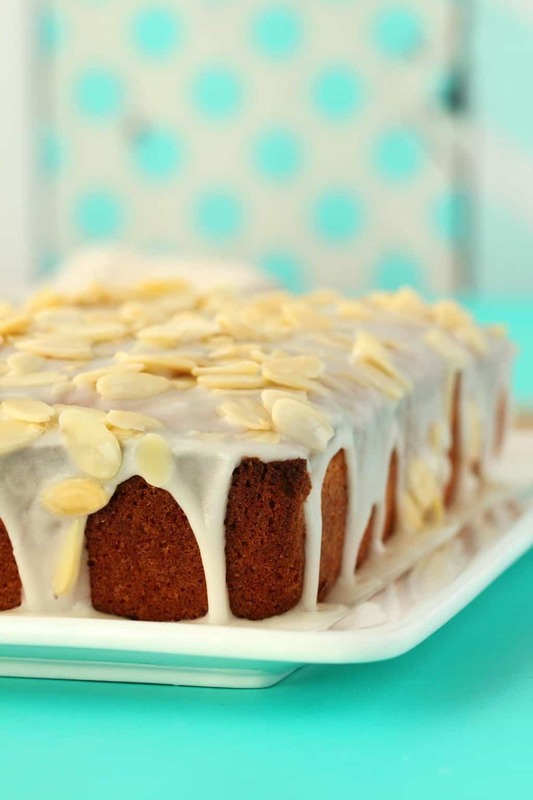 Prepare the almond glaze by adding the powdered sugar, soy milk and almond extract to a bowl and mixing in until smooth. I didn’t use the electric mixer for this, I found it was easy to mix up in a bowl. 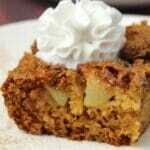 Spoon this out over the top of the cooled pound cake and smooth it down. It will likely run down the sides, this is fine. 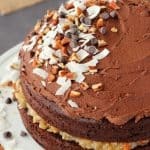 Top the cake with some almond flakes or slivers and place into the fridge for a little while so that the frosting can set. *Almond extract is quite strong tasting so I usually just put a tiny bit on the edge of a spoon and then let a few drops fall into the bowl. Previous Post: « Vegan Quesadillas – Easy, Cheesy and Delicious! 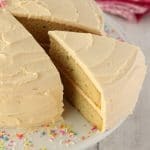 When using vegan butter in baking do you use stick or soft? Have you found it makes a difference? Loving your recipes. Hi Jamie, I use soft vegan butter usually, but I don’t think it would make a difference, so long as you cream it quite well I think the end result would be the same. 🙂 Thanks so much, so glad you like the recipes! My wife made this cake today and I don’t know what went wrong, but it was moist and delicious. Not only that, it also seemed to be twice the size of the one in your pictures. I asked her how she got it to raise so much. She said the trick is in the buttermilk. Rather than let it curdle for about 15 minutes. Also instead of vegan butter she used coconut oil. I thought it was going to be a flop, but I am very impressed with the results. 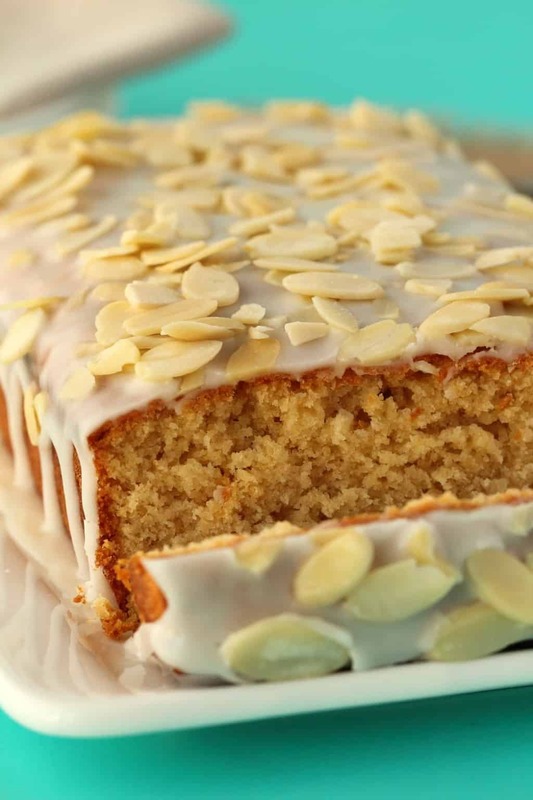 Hi, in the uk we would call this maderia cake, so would you say that this cake is perfect for carving as its firm and dense? Hi, I’ve notice my cake cracks even when temp is lowered, now my baking powder says to use 2tsp per 150g flour do you think it rises too quick that it crusts on top and cracks before inside is cooked? Hi Kelisha, mine is also a little cracked on top as you can see in the photos. If it’s not ruining your cake I wouldn’t worry about it? If you have a fan setting on your oven, you can bake it like that at 320°F (160°C) as this can sometimes result in more even baking and reduce cracking on top. But if it’s not ruining the cake, a few cracks on top are not something that concern me usually. I made this pound cake today in a round cake mold. I love it! 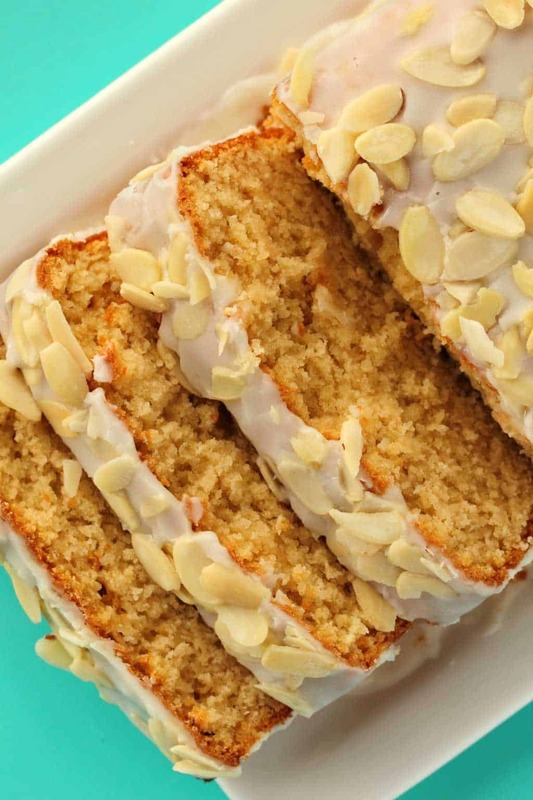 I followed the recipe and it tastes just like a regular pound cake. It rose perfectly and the texture was perfect. What I did was I beat the batter with a spatula for a long time until smooth, although the recipe says not to overmix. I did this because a pound cake recipe I used to use before asked to beat the batter a bit longer to strengthen the cake’s structure. I used a spatula instead of a mixer to make sure I didn’t over do it. 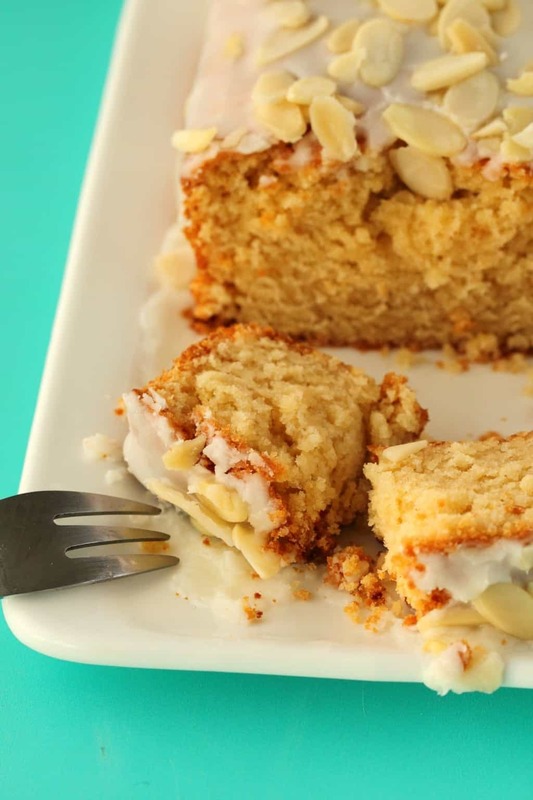 What I love about this recipe is that it uses regular baking ingredients like flour, sugar, baking powder, salt, vegan butter, vanilla, plant based milk+lemon juice. 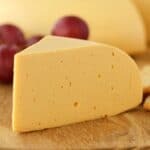 Many other recipes use vegan yogurt or silken Tofu or cream cheese, which may not aways be at hand. Thank you so much for this recipe. 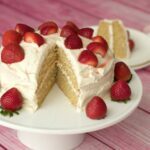 It will be my go to recipe for my favorite cake. And the baking powder tip was very useful. Thank you! 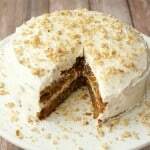 Hi, i came back to your recipe and said let me retry to make this again. So i did. It reminds me of a maderia cake, dense fluffy and yet moist. I love maderia cakes for that but they have egg! Jamaican cakes are usually dense but sometimes dry, this was my perfect dream dense but FLUFFY AND MOIST! I personally find light and airy just “missing” something. I made cupcakes out of these, they melted in my mouth, soft like candyfloss, and i used oil, vegetable oil, i believe if i went with oil maybe it would of been much denser, i dunno but i like the oil. I’ve ran out of all purpose can i just use self raising? Also does it have to be buttermilk or can I use milk only. I’m not sure about using self raising, it might work or it might not. It has baking powder and salt added so it could end up being too much for the structure of the cake. Regarding vegan buttermilk, since you make it yourself, it’s definitely recommended to do it since that’s how the recipe was tested and the best results obtained. If you don’t have lemon juice to make the buttermilk you can use apple cider vinegar instead. Can I sub almond milk for soy?